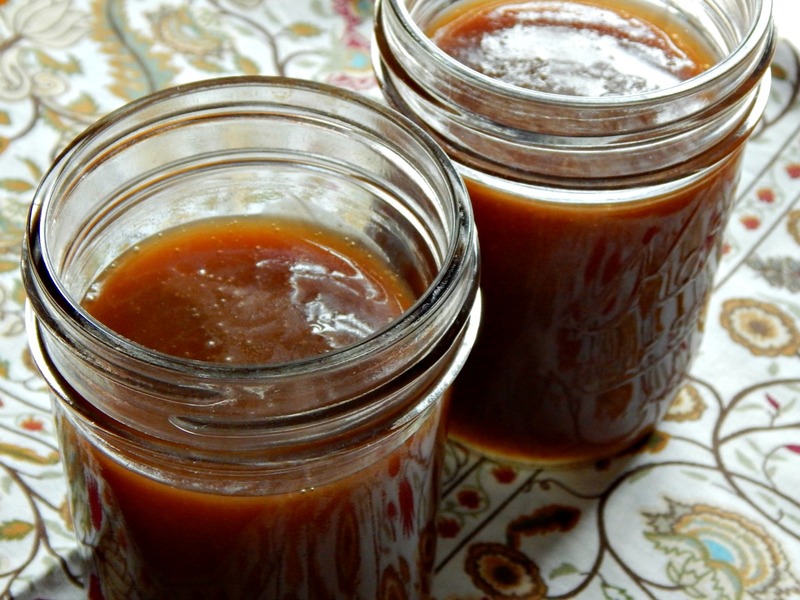 Old-Fashioned Butterscotch (or Caramel) is one of my favorite things – I love the way it drizzles out of the jar in a golden buttery waterfall, hits the cold ice cream, then slides, slowly, over the creamy mound, pooling at the bottom of the bowl. The best part: the cold ice-cream causes the sauce to thicken into an almost candy-like consistency. That is, if you could think of a caramelly candy that it too rich and too soft to pick up…and could only be eaten with a spoon. Mediocre commercial products, filled with additives are absolutely incomparable to the real thing and home-made costs so much less. I did a guesstimate on the pricing – I figure under a buck fifty. Best of all, home-made takes minutes to make. Combine butter, water, and corn syrup in a medium saucepan over medium-low heat. Stir occasionally until the butter is melted and the mixture is combined. Add sugar, stir until dissolved. Increase the heat to medium-high and let the mixture boil (without disturbing) until the mixture begins to turn light brown. This will take somewhere between 4 – 8 minutes. If you see sugar crystals forming above the mixture on the sides of the pan, take a wet pastry brush and press to the side of the pan, allowing the moisture to wash them into the liquid mixture. Remove from heat. Carefully and slowly (stand back a bit) and pour in the heavy cream, stirring until smooth. If the mixture seems lumpy, just return to low heat while stirring. This might be a good time to switch to a whisk. Add vanilla, and whisk again. If serving hot, serve. If not, let cool till warm and pour into a well sealed container. Refrigerate until ready to use – I like to keep in a glass canning jar – keeps for weeks in the refrigerator. Yield, about 2 cups. When measuring something sticky like maple syrup, corn syrup, honey, a quick spritz of the spoon or cup will allow the measured ingredient to slide right out. The measurement will be more accurate, especially if you are measuring multiple spoonfuls or cupfuls. Sticky items will come out cleanly if spoons or cups are sprayed with cooking spray. This entry was posted in Click here for Fabulous Food Posts and tagged Butterscotch, caramel sauce, Cream, Dessert Sauces, Desserts, joy of cooking. Bookmark the permalink. chicagohealthygirl, I added in my other favorite recipe, too. Either is simple, takes only a few minute and are amazing. I know you’re concerned about additives, too – the commercial ones taste pretty good, but are loaded with things I don’t understand. Funny thing is that the commercial ones only taste good until you compare them with home-made. Hope you’ll try them and let me know how you like them. Sounds yummy! I’ll have to give it a try sometime!